This is a chunky dish which can be served as a snack or can be eaten as a dip or as a part of a thaali. The sourness from the finely chopped mangoes really marries well with the coarsely ground Chana dal (Split chick pea). Wash the chana dal / Split chick pea and soak it in enough water for 5-6 hours. Drain the water and wash the dal again a couple of times and set it aside. 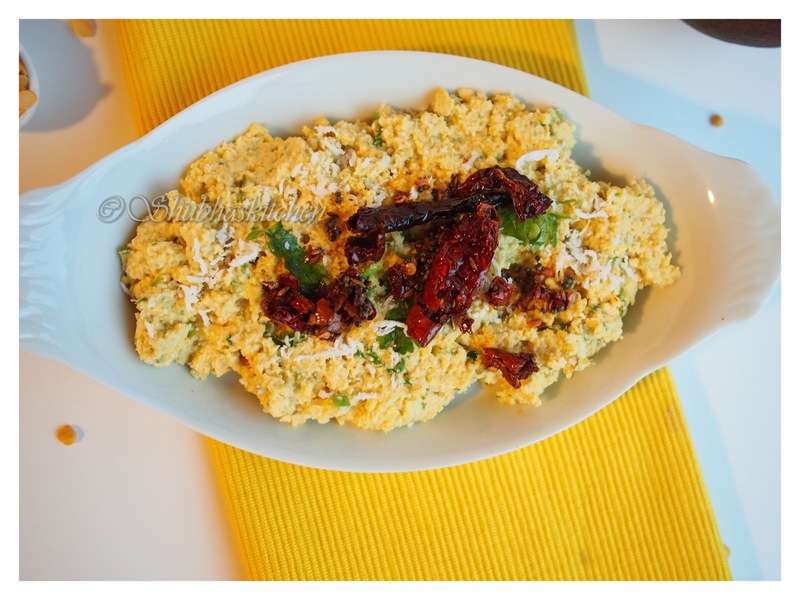 Grind together freshly grated coconut, green chillies, 1/2 cup of chopped raw mango, sugar and salt. Remove the Dal mixture into a bowl . Check for the salt. Add the 1/4 cup of the remaining chopped raw mangoes. Add some lime juice (only if the raw mangoes are not very sour). Also add some chopped cilantro. Mix with hands gently. Set it aside. To prepare the tempering: Heat oil. When hot, add cumin seeds, mustard seeds. When they start to sizzle, add asafoetida, curry leaves and dry red chillies. Turn off the heat. Once the tempering cools bit, add it to the prepared AMBYACHI DAL. Serve garnished with cilantro and fresh grated coconut. Serve as a snack , dip or as a part of a meal. Looks like a really flavourful recipe! Addition of coconut and raw mango must have give a new dimension to this daal! Thank you for the recipe. I must try this one though never made before. Tempting like crazy. 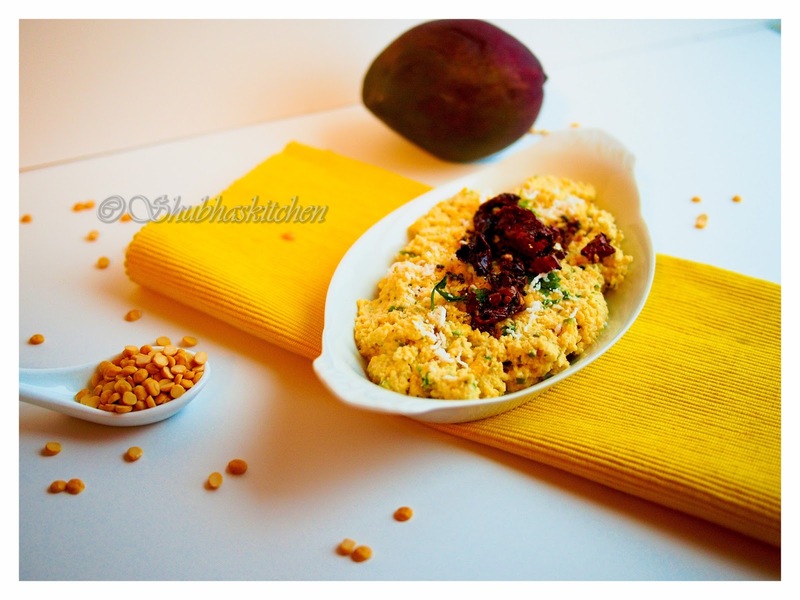 I love combining chickpeas with coconut! This platter looks very delicious, Shubha! Plus with tadka on top! Super tempting! Looks delicious very nice. Love the combo of dal and raw mango. 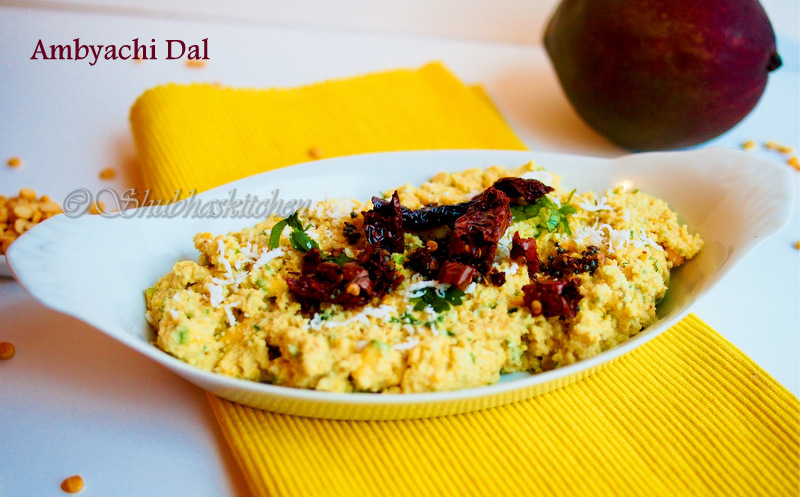 Delicious idea for dal...........must try.very inviting & lovely presentation. Lovely combination dear...new to me ..will definitely try out...Loved it! !